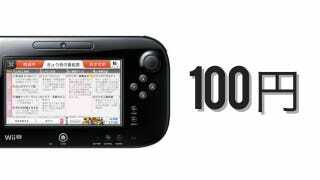 With Nintendo TVii, the Kyoto-based game maker is bringing streaming video to the GamePad. Starting on December 8 in Japan, gamers can watch the pictures as they fly through the air via the comfort of the Wii U GamePad. But if you want easy channel changing, you must barf up extra cash. On December 8, Nintendo is also launching an addon for Nintendo TVii that gives Wii U owners the ability to switch channels via the GamePad. The Wii U GamePad can be used as a television remote control, but if you want to use that same function for Nintendo TVii, Nintendo is charging a ¥100 ($1.22) flat fee. Nintendo's video streaming service was unveiled this September in New York. Earlier this month, Nintendo delayed the service for the North American Wii U launch.